The recent decision of the Hamilton City Council to stop fluoridating its water supply caused a bit of discussion among New Zealand scientists. Discussion of the ethical and practical questions related to scientist involvement in political activism. The Hamilton City council had been exposed to large numbers of submissions from anti-fluoridation activists. Most of them misrepresented the science and gave misleading, often incorrect, information. Scientists could have corrected these mistakes and distortions, but the job was left to a few representatives of the District Health Board and the Ministry of Health. Many scientist think, as do others in the community, that they must play a greater role countering distorted information and pseudo-science. But the scientific ethos of objectivity, evidence-based debate and peer review conflicts with the political nature of such activism. It’s a problem that scientists, especially younger scientists, will have to face increasingly in the future. Quite a few of us have solved the dilemma for ourselves by blogging – a sort of half way point between ivory tower science and political activism. But here is something to think about. Climatologist James Hansen has thought about this issue throughout his life. Sometimes he has opted for pure science, these days he is opting for pure activism. Here’s an excellent video of one of his talks from February 2012 explaining his motivations and history on this issue. It’s also a simple and clear explanation of the climate change problems we are facing now and in the future. Hansen has also written about these issues in his book Storms of My Grandchildren: The Truth About the Coming Climate Catastrophe and Our Last Chance to Save Humanity . Have a look at Global climate – and your grandchildren for my review of the book. Confusion and distortion – has global warming stopped? There’s a mantra circulating at the moment claiming that global warming “stopped 17 years ago.” It is of course being pushed by the pseudosceptics in the climate denial echo chamber. However, even people who should know better have been heard to repeat something like that. Rodney Hide, a former New Zealand ultra conservative politician has assured us “The world stopped getting warmer 17 years ago. That’s incontrovertible” (see my post “Incontrovertible” is it, Rodney? for my take on that). And one of the commenters on my blog at SciBlog seems willing to treat Rodney’s assurance as a simple fact. Of course the pseudosceptics proudly and loudly reassert similar claims. But many of those repeating this mantra are attributing the claim to authoritative sources, like the the Intergovernmental Panel on Climate Change (IPPC) and leading climate scientists and institutions. Short answer is actually no. Slightly longer answer is along the lines that the current rate of global temperature increase seems to have slowed, global temperatures may even have plateaued, but that doesn’t support a claim that global warming has “stopped!” Or stopped 17 years ago. Trouble is, there is no record to back up the claim and the IPCC communications office said it does not accurately represent Pachauri’s thoughts on the subject. The only statement the Australian article actually attributed to Pachauri on this subject is that “global average temperatures had plateaued at record levels and that the halt did not disprove global warming.” And that is paraphrasing Pachauri and not quoting him directly. As the blog Skeptical Science pointed out (see Did Murdoch’s The Australian Misrepresent IPCC Chair Pachauri on Global Warming?) if he “had he said that global surface air temperatures have plateaued and that this doesn’t disprove global warming, he would be 100% correct.” And that is what a number of well-known climate scientists also have said. Usually no mention of 17 years and certainly no claim that global warming had “stopped” 17 years ago. To help clarify I repeat below two figures from my recent post “Incontrovertible” is it, Rodney? These show global air temperatures for the last 17 years and for the long-term – since 1880. The data in the first figure must be put into the context of the longer term changes. And as the 2nd figure shows a number of short periods over the longer term which had a similar pattern to that in the first figure. It would be silly, especially with hindsight, to claim that global warming “stopped” in 1990, or 1985, or 1975, and so on. Yet this is what some people are doing. It’s easy to find short time periods where the global temperature trend is not significantly different to zero – that’s the nature of a record with this sort of variability or noise. A record which also results from a number of factors and is therefore not a simple correlation with one cause. So it is silly to cherry pick a short period and then make an absolute claim (global warming has stopped) – and especially to claim that somehow something happened in 1975 so that “global warming stopped 17 years ago. Think about it. Take that first figure a just select the last 10 years. The trend will also not be significantly different to zero – are we then going to claim something happened in 2002 to “stop” global warming? No, of course not. The only reason 17 years is mentioned is that one can’t go back further than that without the trend being significantly different from zero. It’s a cherry-picked date – cherry picked to produce a non-significant trend. Another common claim is that the very recent plateau, or decrease in the rate of global warming proves the scientific climate models are wrong. More specifically I have often heard the claim that since this plateau has occurred while atmospheric CO2 levels continue to increase this proves that CO2 is not driving global warming. Even the claim that the plateau has somehow shown the scientific understanding of the fundamental properties of greenhouse gases is wrong. The naivety of the last claim is to think that climate scientists consider CO2 to be the only factor influencing the climate – they just don’t. Consequently one should not expect to see a simple correlation between global temperature and atmospheric CO2. Any attempt to understand or model climate change must include many more inputs than CO2. All models are inaccurate. That’s just the nature of the attempt to understand complex systems – we can’t expect to get things perfect. And when anomalies occur this may actually help us improve the models by incorporating other factors or more realistic physical parameters. Despite this models have important uses as long as we understand their limitations. Models require inputs – inputs which may change, often unpredictably, over time. Therefore it is silly to expect model projections to always be correct or accurate further down the track. For example, there could be weather conditions increasing heat inputs into the deep ocean which could not have been incorporated several years ago. Or there could have been an increase of particulates from increased coal use which had not been predicted. Political changes can produce economic changes which influence inputs. These are some of the ideas that have been suggested to help explain the current plateau or reduced rate of global temperature increase. So the real test of the model is not to use inputs based on predictions made several years before, but to update inputs so that the model more correctly represents current situations. But, more basically, it’s important to recognise that the global climate is complex. Simple mechanisms are not going to explain the details in the global temperature record. So be careful of people who advance simple explanations to discredit the science. I wonder if many politicians, or in this case ex-politicians, are capable of seeing the irony and contradictions in their public statements. Or perhaps porkies are just the stock in trade of politicians so irony doesn’t even come into it. But hows this for irony – Rodney Hide is lecturing scientists about the nature of scientific knowledge (see Faith, not facts, drives global warming). Here’s what he says about claims by climate scientists that greenhouse gases like CO2 can lead to global warming. That’s religious zealotry in action. Science is never that certain. The best-ever scientific knowledge was Newtonian mechanics. And Einstein blew it to bits. That’s the nature of science. It gets nearer the truth but can never declare the truth. Only religious fundamentalists have certitude. Their knowledge is a belief system that’s immune to real world experience and facts. “Incontrovertible” is it Rodney? That sounds like a statement of faith. Still believe that “The world stopped getting warmer 17 years ago. 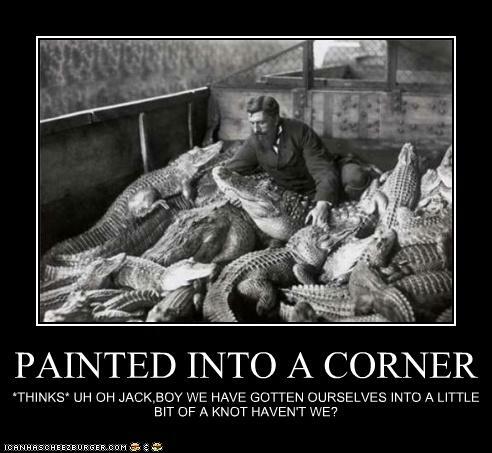 That’s incontrovertible,” Rodney? Willing to put money on it? More important – would you as a politician be willing to commit the fate of your grandchildren on such an extreme claim? Well, if you still think your claim is “incontrovertible” have a look at some more data. 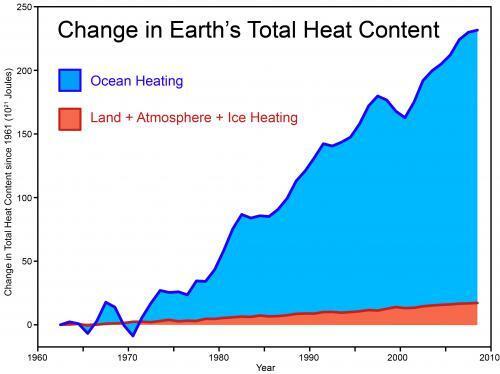 Here’s data for the change in the total earth’s heat content – storage in the ocean as well as atmosphere, land and ice. He would love that, wouldn’t he? It would give him and his ultra-conservative political mates a completely clear field. But wouldn’t it be irresponsible to gag scientists like that? 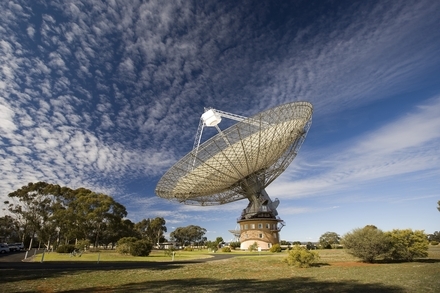 Surely we want governments to use the country’s scientist to get the best current data and conclusions – even as we acknowledge that it is never the final story. Perhaps this is what is leading Rodney Hide astray. In a comment at the climate pseudosceptic/denier/contrarian blog Climate Conversation Group Rodney acknowledged he is using that blog as a resource (a fabulous resource and mine of information“) Bloody hell, no wonder he has it so wrong. He really has to widen his reading. Mind you, one of the resources he may have used is Richard Cummings who claims in comments on that blog he has shown that our scientific understanding of the fundamental properties of greenhouse gas molecule is all wrong! I suggested that he should present his findings at this year’s New Zealand Climate Change Conference. And this crowd could also present their analysis of New Zealand’s temperature record which they produced as an alternative to that of NIWA. However, they seemed to consider these suggestions offensive and banned my comment! When I write here about climate change you can be sure one or more trolls will pop up and tell me about the snow in the UK. Or accuse scientists of relying on this year’s New Zealand drought in their claims of climate change. It seems surprising that no matter how many times we point out the climate is not the same as weather, and global climate change is not the same as local or regional weather, some people seem to think such arguments are valid. “Global average surface temperature is perhaps the single most representative measure of a planet’s climate since it reflects how much heat is at the planet’s surface. Local temperature changes can differ markedly from the global average. One reason for this is that heat moves around with the winds and ocean currents, warming one region while cooling another, but these regional effects might not cause a significant change in the global average temperature. A second reason is that local feedbacks, such as changes in snow or vegetation cover that affect how a region reflects or absorbs sunlight, can cause large local temperature changes that are not mirrored in the global average. We therefore cannot rely on any single location as being representative of global temperature change. This is why our study includes data from around the world. Temperature anomaly data (thin colored lines) at the same locations as the 73 paleotemperature records used in Marcott et al. (2013), the average of these 73 temperature anomaly series (bold black line), and the global average temperature from the National Climatic Data Center blended land and ocean dataset (bold red line) (data from Smith et al., 2008). If you doubt climate change is complex have a look at this global temperature record from NASA’s Goddard Institute for Space Studies. There’s a lot of noise in that graph but it does sort of support the conclusion that global temperatures have increased in the last 100 years. Mind you, if you want to create a contrary impression you can easily take a short time period – say around 1950, 1960 – 1980, 1985 – 1995 – or even the last 16 years. Cherry picking is a great thing – if your aim is to support a predetermined conclusion, and avoid (or even hide) evidence to the contrary. So we get this sort of thing being promoted by climate change deniers (thanks to Andy for this one). Didn’t someone say a little knowledge is a dangerous thing? And isn’t cherry picking a great way of restricting knowledge? So, just to repeat myself – here’s an extract from my post Climate change is complex. It indicates some of the scientific knowledge that climate change deniers/contrarians/sceptics ignore when they cherry pick to make this silly claims. 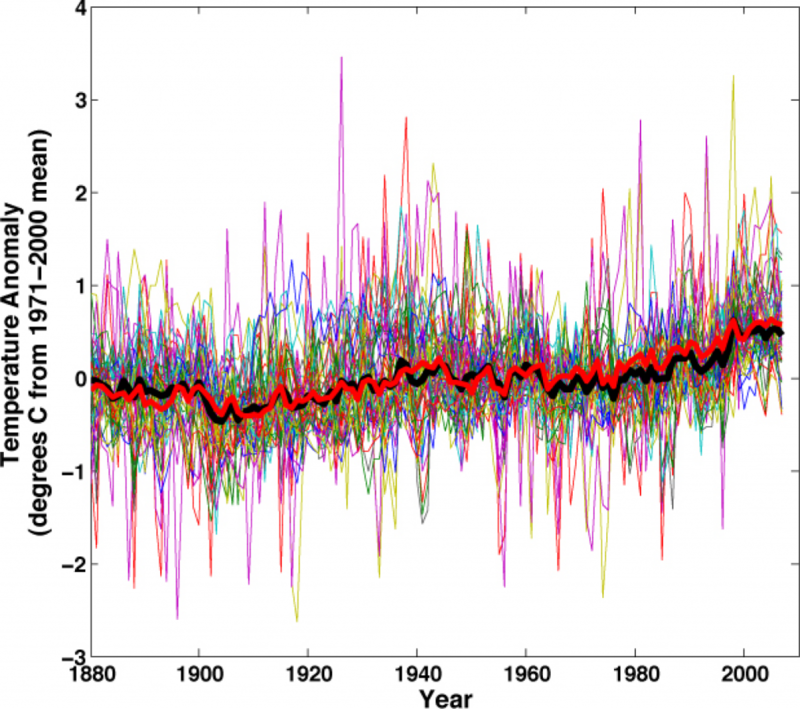 The figure below shows the results of simulations of global temperature from 1900 to 2005. Figure a included all the natural and anthropogenic influences. The black line is the actual measured global temperature anomaly (obtained by subtracting the average temperature for 1901 to 1950). The individual simulations are shown as thin yellow curves. 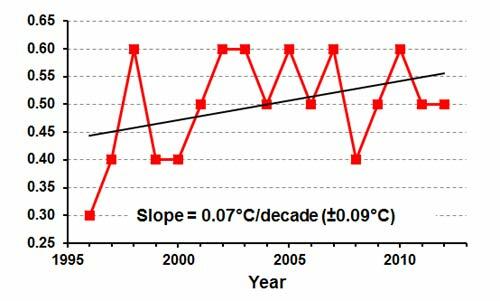 The red line is the multi-model ensemble mean (see Figure 9.5 – AR4 WGI Chapter 9: Understanding and Attributing Climate Change). So, climate scientist have considered both natural and anthropogenic influences. And they are unable to reproduce the global temperature changes since 1970 unless anthropogenic influences are included. That is why the IPCC has concluded that there is a high probability (>90%) that human influences are contributing to the current observed global temperature increase. Notice also that the experts talk about probabilities. It’s a complex field and things are rarely cut and dried. We are more certain about some influences than others. And the IPCC doesn’t hide this fact – far from it. It doesn’t make sweeping claims in the way that some of their opponents do. We can see this in another figure from the report (Figure 2.20 – AR4 WGI Chapter 2: Changes in Atmospheric Constituents and in Radiative Forcing). It shows the estimated influences of several human caused effect and solar radiation since 1750. Notice the error bars. They are much bigger in some cases than others. Notice the assessment of scientific understanding for these influences. We have a high understanding for some of them and a low understanding for others. So, climate scientists aren’t hiding anything. They are not ignoring natural effects. They are up-front about probabilities. They acknowledge that we need more information is some areas. They are behaving like professionals. Considering there are areas where scientific understanding is low there is clearly room for debate, discussion and more research. But deniers and contrarians who take an extreme reductionist stance, misrepresent the IPCC reports and attack honest scientists doing the research are not in a position to contribute to this. Here’s a great new booklet that everyone interested in science communication should read – especially science bloggers. It’s the The Debunking Handbook by John Cook, Global Change Institute, University of Queensland and Stephan Lewandowsky, School of Psychology, University of Western Australia. While the booklet is aimed primarily at advising the best way to counter science denial and distortions the advise can be applied to any popular science communication. What’s more, the booklet itself is an example of excellent communication principles. It’s compact (only 8 pages), its message is upfront, its easy to understand and it’s illustrated. “1. Don’t lead with the wrong view you’re trying to debunk, but rather, with the correct view you want to instill. 1. Use graphics to convey correct information. Especially graphics as good as the ones that Cook and Lewandowsky use. 2. Use sound bites. Your bottom line needs to be Tweet-able. I recommend you download the booklet, read it and keep it on your desk. Especially if you blog about science, or do a lot of popular science communicating in your day job. Thanks to Chris Mooney: The Science of Debiasing: The New “Debunking Handbook” Is a Treasure Trove For Defenders of Reason. This looks interesting. Skeptical Science has introduced a Firefox add-on which enables an internet surfer to rapidly check out the arguments found on web pages and blogs. Great for those without a specialist knowledge in the area of climate science. So much of this information on the internet is distorted or downright wrong. This could save the interested surfer the time and effort required to research claims for themselves. As the image above shows the report includes information on the real science. I can see people wishing to place comments at an offending blog using this feature. The add-on also enables interested surfers to make their own reports on blogs and web pages. Those supporting the science as well as the offending ones. This will provide a chance for the more interested surfer to contribute information and links to the Daily Climate Links email and Global Warming Links page. A chance to contribute to a very useful resource. Go to Skeptical Science Firefox Add-on: Send and receive climate info while you browse for more information on the add-on. Looks like it could be fun. You can download the SkS Firefox Add-on at Skeptical Science 1.0. See also: Get your climate change science on the run for details of Skeptic Science’s iPhone and ipod Touch application. Another useful way of checking our the science of climate change.